Cathy & Marcy have created hundreds of online lessons and work extensively with both Truefire and Homespun Tapes to help you learn in the comfort of your own home at the time of your choice. Get together with friends at parties, picnics and campfires and create harmony parts to your favorite country, bluegrass and folk songs. Learn the powerful singing styles of the great country and western stars. These CDs are great for practicing at home, in the car, or on top of a tall mountain. All you need are some simple tools, easy-to-find materials, and some creativity and you're on your way! Here's an exciting way to increase your repertoire of old time tunes and gain confidence when you join in the sessions at parties, festivals, camps and other musical events. 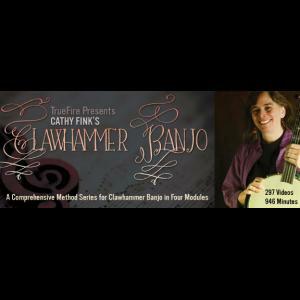 Here's a terrific lesson for banjo players who want to sing and accompany themselves in the clawhammer style. For both basic and accomplished pickers. Here's an exciting way to increase your repertoire of old time tunes and practice up for those inevitable jam sessions at parties, festivals, camps and other musical events. Here's the coolest way ever to learn to play an electric guitar! Two-time GRAMMY? winner Marcy Marxer teams up with top studio musician Pete Kennedy to inspire kids and get them off to a great start. PARENTS' CHOICE RECOMMENDED! Save when you buy BOTH of these electric guitar electric guitar lessons for kids! This great course by a two-time GRAMMY? winner and a top studio musician will inspire pre-teens and teens to get excited about music. Anyone can learn to solo on the guitar! Even if you're a novice, as long as you know your basic chords, you can start playing melodies and improvising lead parts. With clarity and lots of good humor, noted children's performer Marcy Marxer teaches basic chords and strums and gets your kids singing some great songs! Includes chords in a PDF file to view or print. If your child is ready to learn more chords, strums and songs, Marcy's second series of guitar lessons moves to a whole new level. These two lessons are a great way to get your child into the joys of music. The whole family will be playing and singing together in no time! Booklet with chords and song lyrics available. This child-friendly, engaging instructional CD and book is specially designed to give your child a repertoire of great songs and new guitar techniques. 32-page songbook available in print w/CD.